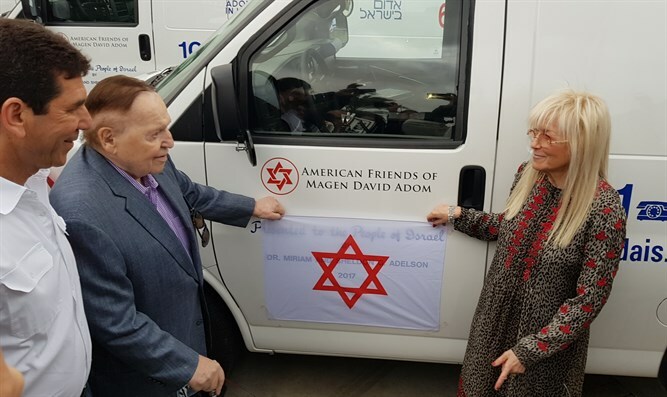 In a special ceremony in Tel Aviv on Thursday, MDA inaugurated four new armored ambulances donated by American Jewish philanthropists Sheldon and Miriam Adelson. The ambulances, which are manufactured by Chevrolet, can be utilized both as ambulances and mobile intensive care units. The armor is added to the vehicles upon their arrival to Israel in accordance with the Home Front Command standard. MDA EMTs and paramedics who will drive the vehicles have been trained to operate under threat and fire. The vehicles will be deployed in Judea and Samaria, along Israel's northern border, and around communities near the Gaza Strip. They are an integral part of a system of vehicles used for response to terror attacks, aiming to transport teams to scenes safely, and protect patients during evacuations to hospitals. The Adelsons told Arutz Sheva that they had hoped that their ambulances would provide a higher degree of safety for Judea and Samaria residents, who are often subjected to terror attacks by the neighboring Arabs. "There are people living there, [Jews and] Arabs as well. The whole idea of MDA is to provide ambulances to save lives," said Sheldon Adelson. The ceremony was held in the wake of MDA's recent announcement that it would have to close most of its emergency response centers in Judea and Samaria if the Finance Committee did not immediately transfer funds allotted to MDA. MDA, a volunteer organization which operates most of Israel’s ambulance services, is funded in part by the government and is allotted a regular budget from the Health Ministry. However, MK Bezala Smotrich (Jewish Home) sent a letter to MDA vowing to ensure that the Health Ministry funds promised to MDA would be released in the near future. In light of Smotrich's letter, MDA Director General Eli Bin promised Monday evening to resume full operations in Judea and Samaria.